If you want to carry a piece of fine art in your pocket, you absolutely must take a look at these jaw-dropping folders by Glenn Waters. A jewelry maker by trade living in Japan for over 30 years, his distinctive style is indescribable. Every surface is adorned with meticulous detail, with handmade accents featuring dragonflies, skulls, and masks from Japanese theater in 24k gold and silver. We could write paragraphs about the beauty in these knives, but you’ll just have to follow the link and see for yourself. 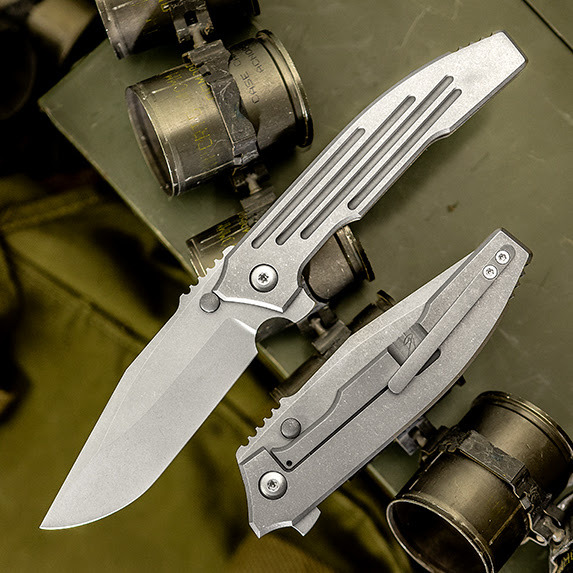 With design by Tashi Bharucha and production by the South African team of André Thorburn and Andre van Heerden, the A6 Mini is a perfect EDC flipper. The 2.75” drop point blade is classic but distinctive. It pairs well with the narrow handle and it’s easy to get a lot of precision work out of the M390 steel. The first flip is all it will take to be addicted to the A6, as the IKBS pivot bearing makes the action a dream. Myriad carbon fiber handle options, including black, blue, red, and marbled, means you can find the one that is just right for you. Battleworn and battle ready, the Smock Custom SK10 is designed to be carried to complement your sidearm. 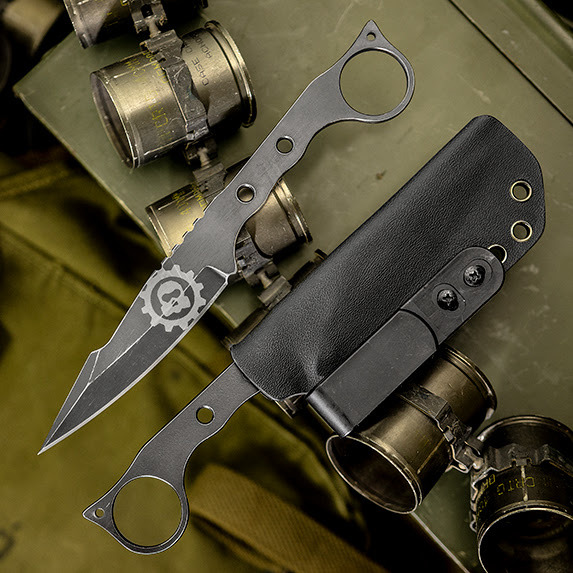 With a thin, easily concealed blade and Cerakote finish, quick cuts and jabs are always within reach, and a friction fit Kydex sheath will keep things nice and secure. 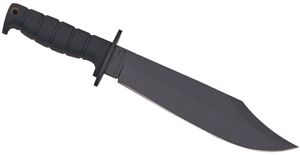 The cherry on top is the CPM-3V steel, made in the USA to the most exacting standards. The Matt Diskin Revolution not only works well and looks great, it also hides a surprise feature right in plain sight. The presentation scale itself fires the blade open blindingly fast, locking up every time without fail. 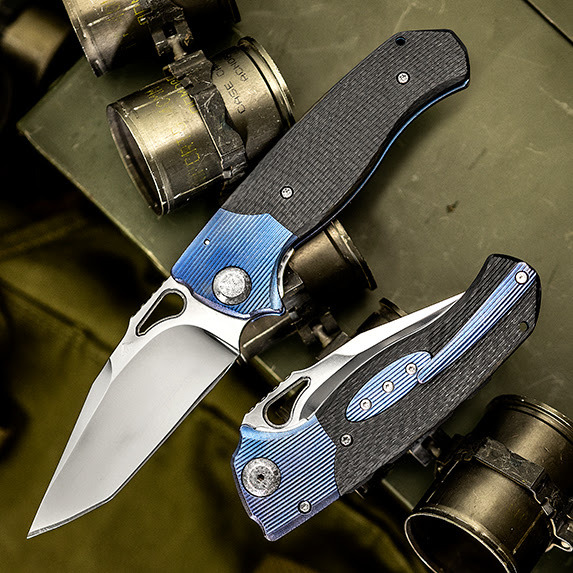 The action is backed up by beautiful materials including milled carbon fiber, integral blue titanium bolsters, polished M390 blade steel, and a Damasteel pivot. The Vox style is unmistakable and in high demand, so we are thrilled to have new F4 and FX models to bring to you. 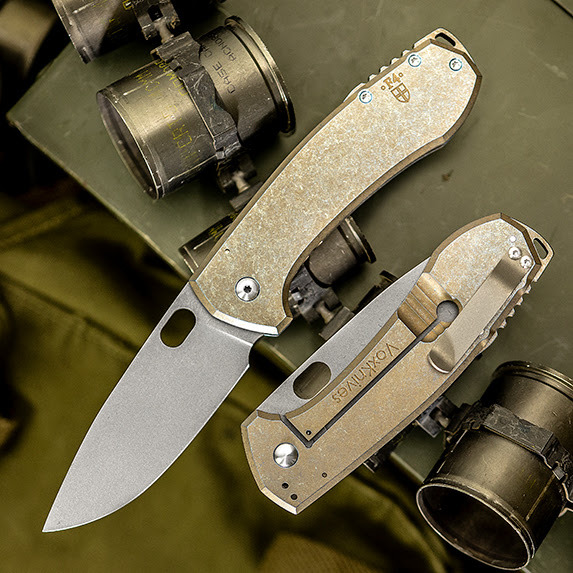 With blasted and stonewashed CPM-154 or RWL-34 steel, the knives perform as good as they look. 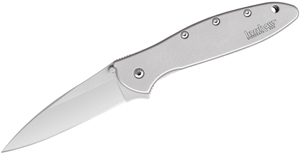 The FX is a great compact knife for any task at hand with a 2.75” clip point blade. The F4 is a bit larger with a 3.375” drop point, which makes it suited for bigger work while still being easy to carry. Rustic anodized stonewashed frames complete the look, making these hardy and eye-catching EDC options. 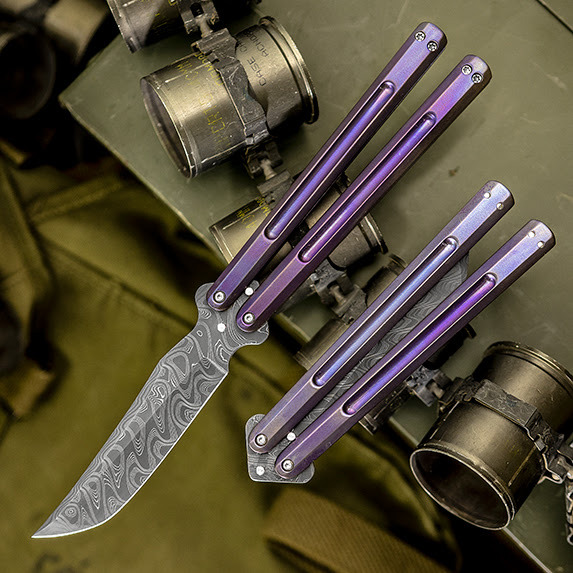 Looking for a fantastic bali but want something a little different, unique from the knives everyone else is flipping? These Chuck Gedraitis balisongs are one-of-a-kind with premium construction, buttery action, and no blade play whatsoever. 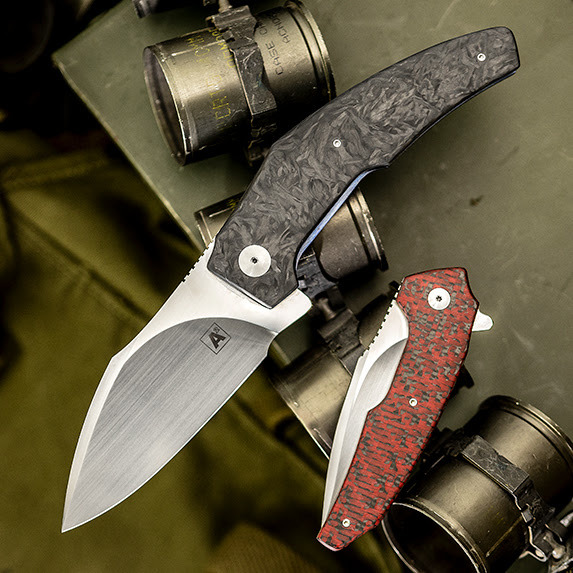 The world is your oyster with two different steel options, CPM-154 or Nichols Blackout Damascus. 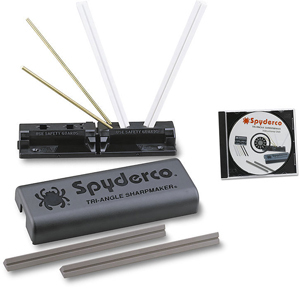 Supremely perfect in terms of balance, smoothness, and fit and finish, you’ll stand out from the crowd for sure. We’ll keep the Bali train rolling with the custom Peña-Song from Enrique Peña. 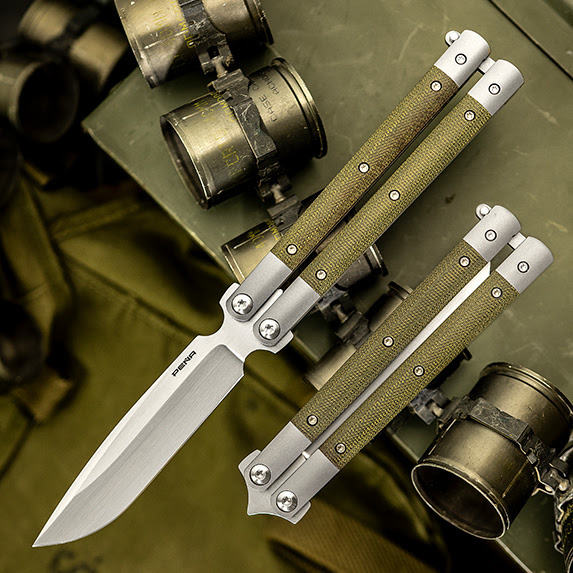 His first butterfly knife design amazes with ultra smooth bearings, CPM-154 steel, and incredibly precise production. 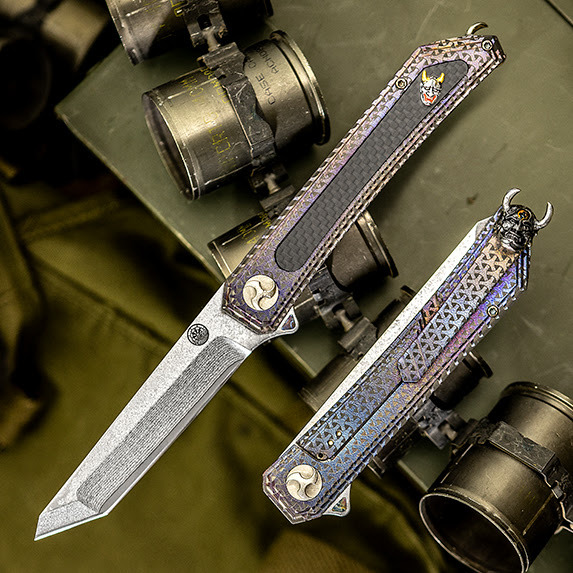 A titanium frame with Micarta inlays keeps the weight low and the grip high. Collect it, use it, flip it, but most importantly, don’t miss it! Don’t worry, we’ll be back next week for part two. We have a bunch more stuff from NYCKS still to add including pieces from Mick Strider, Sal Manaro, Koji Hara, Ken Steigerwalt, and a piece each from the Barajas brothers. We get new customs and mid-techs in every day, so feel free to comment below with inquiries!